Blocking USB ports should only disable the usage of mass storage devices like external hard disk drives,pendrives, flash memory, memory card readers,bluetooth devices,usb data cards and any such device in which information can be stored. Devices like usb mouse, keyboards should still work with the usb ports. These devices are differentiated as Human Interface Devices or HID. We need to disable USB ports to prevent unauthorized/confidential data transfers. Once this value is modified reboot the computer or restart the explorer.exe process from task manager (this will reload the latest value from registry). Now try to connect a pendrive/mass storage device. Windows will not read it and thus we have successfully blocked the usb ports. Lets validate if this was successful by doing another test. Consider that the registry value has been changed to 4 (disable USB storage devices) . Once the login screen appears , don't login but wait for a minute or so. The new device is detected by the USB port and is now accessible once you login. This happens because , if no user is logged onto the machine yet , windows uses the OS Kernel or the SYSTEM user in background to install the new device. This a hidden user on any windows machine and has a higher authority than the administrator. Check the value of USBSTOR registry key mentioned above. Value of start has been reset back to 3. Lets investigate more on how to make a fail-proof solution to block usb ports. 2. Deny full control to the SYSTEM user to access/reset this registry key. Well now the question arising are : "programmatically setting usb stick ACL ?" 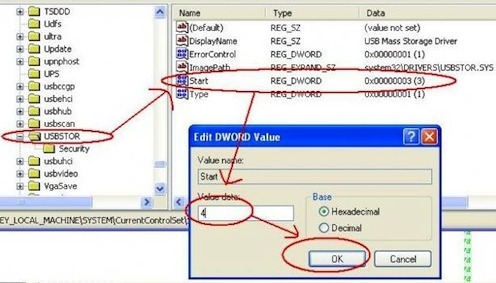 or "regedit usb pen drive disable hide"
If you want to do this programmatically , first step is very easy ... we can run regedit in silent mode on remote machines.For step 2 we need to use the subinacl.exe - a tool by Microsoft to set/unsetaccess control lists (ACL) remotely/locally. CACLS command can be used to display or modify Access Control Lists (ACLs) for files and folders. We can also use cacls to block USB ports.